It's happened both times I’ve seen Y/our Music – there’s a magical moment when what’s happening on the screen is so overwhelmingly powerful and joyously incredible that the audience breaks out into applause, as if it were a live concert. I imagine that same scene will be repeated many more times as the documentary by co-directors David Reeve and Waraluck Hiransrettawat Every comes to Bangkok cinemas next week. A picture of contrasting music tableaux – from precious indie musicians in the city to veteran National Artists in the rural Northeast – Y/our Music toggles back and forth between the traffic-clogged streets of the capital and the sleepy villages of Isaan. Almost imperceptibly, the hum of the urban machine is replaced by the buzzing of insects in the rice fields. Yet there’s a divide between the two scenes, which is acknowledged by that curious oblique slash in the movie’s title. But, rather than wringing worried hands over our nation’s political divisions, Y/our Music seems to embrace and accept the differences, and be content with just letting the city folk and their country counterparts do their own thing. Made by a small crew using often-borrowed equipment, Y/our Music has an easy-going style, keeping out of the way so the musicians can tell their own stories. And, despite its low-budget roots, the film has polished production values, with the highlight being a top-notch sound design that’s best appreciated in a proper cinema. Bangkok is represented by an oddball array of performers, while the Isaan artists are more obviously talented. Among the Bangkok bunch is Wiboon Tangyernyong, an optician who fell in love with the sound of the saxophone and decided to make one himself out of bamboo. Very much an amateur, it took Wiboon much trial and error and many years to perfect his construction process. But, adapting his lens-grinding expertise to fashioning bamboo sax parts, he’s now made more than 800 of the warm-sounding woodwinds, which he sells along Khao San Road and to clients around the world. There’s more do-it-yourself spirit with Bun Suwannochin and his mother-in-law Worranuj Kanakakorn, who form the cute indie-pop duo Sweet Nuj. 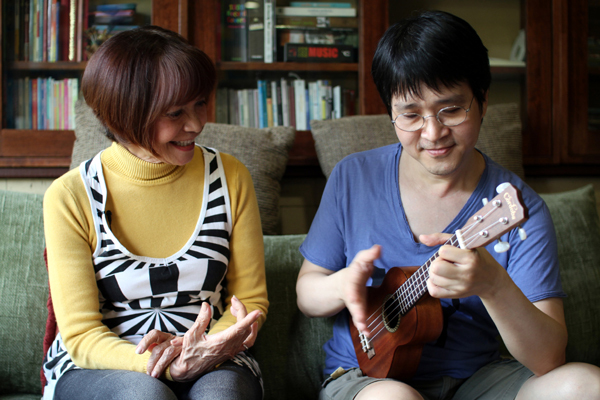 With Bun strumming a ukulele and his mum-in-law singing, they release their music through their own Baichasong record label, and have attracted a niche following. Even quirkier is Happy Band, a rock group put together as a pop-art project. 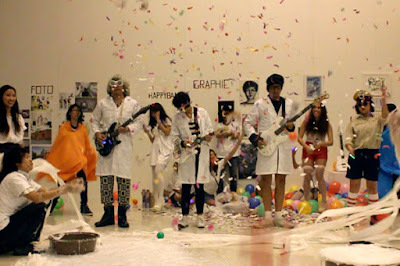 Despite having only one member who could actually play an instrument – famed graphic designer Nadda “Lolay” Srithongdee on guitar – the band became sought after. The other members, Thaweesak Srithongdee on bass, Boonchai Apintanaphong on guitar and Jarinee Liwarewitaya on drums, improved over time, and Happy Band went from being merely art objects to a real band. They even performed at Bangkok’s Fat Festival back when it was still a thing. The spirit of Suntharaporn Big Band leader Eua Sunthornsanan and his violin is recalled in segments devoted to Captain Prasert Keawpukdee, a gentleman who should be well known to shoppers at Chatuchak Market. It’s there where Prasert, 75, sells used violins, other instruments and Buddhist amulets. Weekends usually bring together fiddlers and other amateur musicians who go through the classic old tunes. At one point in the film, a farang customer grabs her male companion and the two start waltzing around the crowded market. Merging the city and country scenes is Nattapol Seangsukon. Better known as DJ Maft Sai, his Paradise Bangkok nightclub parties sparked a hipster revival in mor lam and other music from Isaan. With a cigarette perpetually dangling from his lips, he’s shown sorting through vinyl LPs and 45s at Zudrangma, his vintage record store, and creating dance mixes of mor lam and retro Thai funk. The talents from the countryside are more formidable and awe-inspiring. Among them are two National Artists, singers Chaweewan Phanthu (nee Damnern) and Chalardnoi Songserm, along with pin master Thongsai Thabthanon and the blind khaen virtuoso Sombat Simlhar. 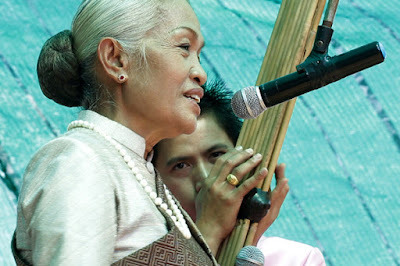 Among the segments is a concert featuring Chaweewan and Chalardnoi backed by a handful of younger musicians, which offers reassurance that traditional Isaan folk music remains vital. What’s troubling, though, is that the only attendees at the concert are middle-aged and elderly women and a few children – all the men are away working in Bangkok. A die-hard professional, Chaweewan is an especially domineering performer, neatly composed with her grey hair in a tight bun, despite the humid conditions and a quickly approaching monsoon storm that signals the end of the gig. 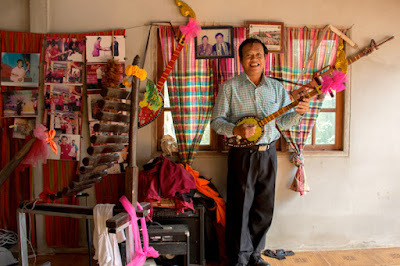 Thongsai, a master of the two-string pin or Isaan banjo, recalls developing his style during his military service in the 1960s, when he was among the first to add wiring to the ornately filagreed instrument. He plugged in and played alongside Western-style rock bands. He makes it look easy as he shows youngsters how to rock out Isaan style. Later, while holding court at his Ubon Rachathani home, he adds a dozen or so drummers for a scene that’s particularly memorable. 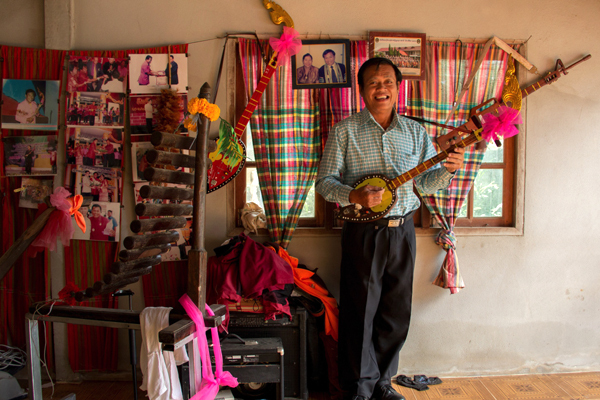 Finally there’s Isaan reed-pipe player Sombat, who became blind as a child and took up the khaen to earn a living. He’s recorded with most of the well-known mor lam and luk thung singers and often turns up on TV variety shows. Still based in the Northeast, where he’s shown sitting by a rice field as he teaches a young woman how to play the finicky instrument. He remains much in demand as a performer, and, after awhile, a crucial phone call from Bangkok brings Y/our Music full circle.